These are the pages that made history by shattering long-held gambling myths and brought the science of wagering to the world. Long out of print and extremely hard to find, a very limited number of original copies are once again available. 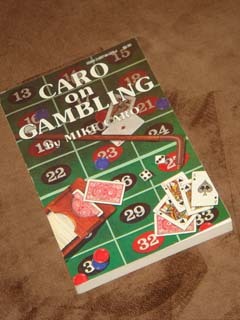 The first book by Mike Caro ever published. Putting probability on your side once and for all. Page 162. A collector’s dream purchase — totally unexpected! Poker, casino games, various bets, motivation, and much more. The first-ever precise strategy for video poker. Page 51. Some of the most powerful writing about gambling ever published. Mike Caro at his best. 23 incredible chapters you’ll never forget. A rare Mike Caro book. A rare opportunity. Available only while the remaining supply lasts.